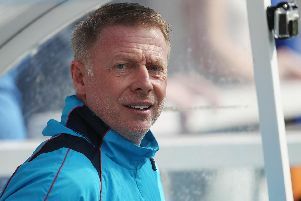 Hartlepool United boss Craig Hignett will be backed in the January transfer window, according to chairman Gary Coxall. Despite calls from some fans to axe Hignett, just seven months into the job at the Northern Gas & Power Stadium, the Pools supremo is sticking by his man. And Coxall has gone even further than that. This isn’t how we do things at the club now. He has revealed that himself and Hignett have already lined up a number of players to target in the winter market. The Mail understands plans for January will be firmed up this week, as the club look to add at least two new faces to their youthful squad. Experience is said to be at the very top of the manager’s wishlist, although the club’s polciy of signing and developing young talent will not be abandoned. Before the game at the weekend, Coxall came out in support of Hignett, despite the club’s recent slide down the League Two table. Pools have won just three games this campaign, none of which have come at The Vic. But that does not mean Coxall is in the mood for change. Prior to the Barnet loss, Coxall said: “I can’t not address some of the messages I received over the week past, calling for everything to be changed from players to our manager. “This isn’t how we do things at the club now - we’re implementing something that will give us the firm footing to progress and grow for years to come. Who expects no stumbles along the way? Not me, for one. “A huge part of this project is to stand firm, with each other, as one club, in times of adversity, so when those stumbles happen we have the togetherness to come back stronger. “To borrow an infamous quote - ‘We go again’. That sentiment had not changed by the end of the game, though. Again while using his own Twitter account the chairman repeated his backing for Hignett. He continued: “The hard part is that we are really not that far away. “We have one area to concentrate on - we get that right and we’ll kick into gear.